Wow, now this really is a knock out spring cleanser! It’s a super easy recipe and you’ll need to make it within the next month before the nettle stalks become too fibrous to be processed in your juicer / blender. Simply put everything into the juicer and blend! Ensure that you only pick the fresh young heads of the nettles and when you gather the cleavers that you don’t accidentally de-root them. 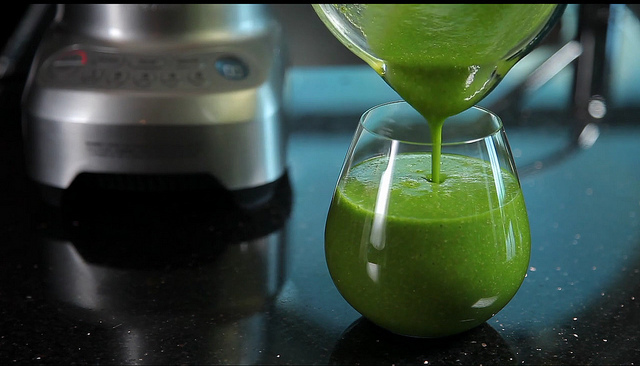 If you don’t have a blender, simply put cleavers into water overnight and shake the mixture. In the morning you’ll have a slightly sweet and cleansing water to drink that is surprisingly delicious… even kids have been known to like it! Serve as a pure juice or add a shot of vodka for the cocktail lovers amongst you – it’s a deadly drink and awaits a knock-out name! Easy recipe, must try this. I am looking to make herb tincture, medicine etc for cysts on liver, crowns disease, persistent coughing and oesteoarthritis. I would prefer to make one medicine to tackle one or two of my illnesses and see how it goes.